Designing an effective website for your company needn't be difficult or astronomically expensive. It simply requires that you put the buyer, not the design, first - meeting their needs at every stage of their journey. 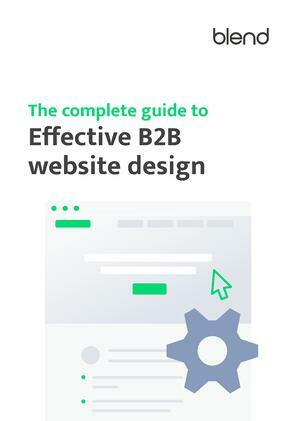 In this guide we look at what it takes to design an effective website for your business. We detail the steps you need to follow to ensure you build a site that attracts, engages and converts visitors – not just another online brochure. Download this guide as PDF or read on below. In the past, websites were online brochures, built to look good and nothing else. Maybe they influenced offline purchase decisions – maybe they didn’t. But as buyers, search engines and the web have evolved, this approach has become obsolete. Sales people and traditional lead generation methods can no longer reach and influence prospects the way they once could, and control of the buying process has shifted to the buyer. The website, meanwhile, has become a core component of modern buyers' self-service approach to research and decision making. An effective website, therefore, is one that serves this need, by helping buyers perform their research while generating qualified leads for the business to sell to. While an effective website must look good, effective website design is about much more than visual appearance alone. It includes the strategy behind the site, the structure, content, layout, SEO and more. This guide is the result of research, practical experience and real world results. We've tried to make it as easy as possible for you to get it right on your own website. Let's get started. What is an effective website, and how do you create one? First and foremost, an effective website is one that generates leads for your business. More specifically, it should generate leads regularly and in sufficient volume to enable you to grow your business. To do this, your website needs to fulfil a number of different objectives. First of all it has to have traffic. This means it needs to be discoverable, particularly in organic search but also in other relevant channels. Second it needs to engage visitors. This is multifaceted and ranges from creating an instant connection to providing a clear customer journey and a positive user experience. Third it needs to convert! It needs to take an anonymous visitor and support their decision making process so well that they want to convert, either to obtain more information or to go straight to purchase. While creating your new, more effective website requires a different approach to before, there is still a lot to be learned from the current situation, both internally and externally. Your research should start on your own current site. Make sure you've had Google Analytics and Search Console (previously Webmaster Tools) running on your site as long as possible before starting to plan your new one. In Google Analytics, look for the pages that have the highest and lowest traffic. Pages with a large share of overall traffic are candidates for keeping in your sitemap, and ones with a low or no share are candidates for scrapping. You still need apply your judgement, as low traffic could point to problems with SEO or navigation, but be ruthless – pages that no one reads still cost money to produce. Search Console will reveal any technical problems that could be skewing the results you are seeing in Google Analytics, and you should plan to resolve or avoid these in the new site. Typical problems include missing or inaccurate sitemaps, crawl errors or, in the worst case, manual spam actions. Take notes, and plan to follow best practice for resolving each type of problem. 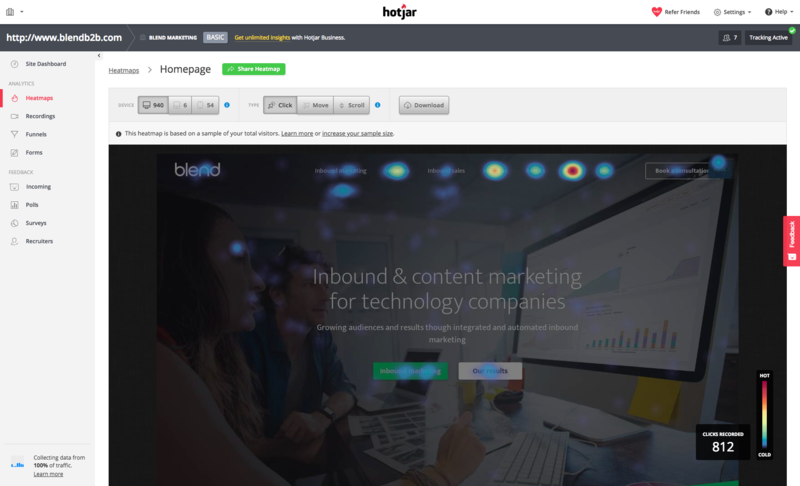 We also recommend that you install Hotjar on your website. A free account will let you create a limited number of heat maps and visitor recordings. These can show you how visitors really 'see' your site, revealing where they spend their time, where they click and what they ignore altogether. Next, look at the sites of your competitors. Not only do you want to be on the lookout for signs of what is working in your sector, you also want to make 100% sure that your differentiation is clear. Accidentally emulating the design of a competitor (which is easier to do than it sounds) or intentionally adopting identical positioning is not going to result in an effective website. You can also get some insight into which keywords their websites are optimised for and use this information to support your own keyword planning. Tools that can help with this are SEOBook's Keyword Density Analyser, which tells you what the most frequently used words and phrases on any page are, and SEMRush, which can provide insight into competitors' organic and paid search performance. What works online is constantly evolving. Thankfully, there are lots of people trying to help us build effective websites, and there is always plenty to read on the subject – just Google around. In particular, we can all benefit from the work done in the area of effective SaaS websites. SaaS companies are data driven and typically run lean, meaning the impact of every marketing dollar is scrutinised and they have clear knowledge of how their websites contribute to business growth. Having a clear and concise value proposition is an essential component of effective website design. An effective website builds a connection with visitors the moment they arrive and builds their trust as they explore. You can do this by being clear about who you are and what you do, and ensuring you do not muddy the waters of their understanding. In order to build an effective website, you are going to have to get real about what you can really do best, and for whom, and use this to inform everything that follows. Creating your value proposition is a sound way to go about it. Once created, your value proposition will play a role in your keyword strategy, sitemap, navigation, and your homepage design as well as informing site-wide design and copy writing. It will also be the lens through which you monitor performance and plan improvements. Being found in search, by buyers at all stages of the buying process, is key to an effective website. To achieve this, plan your keyword strategy before you plan your website. By identifying your target keywords first and building them into your site structure, content, page names and URLs, you give your website the best possible chance of ranking highly for them. You also ensure that your blogging, content marketing and social media all support your rise up the ranks for these desirable, competitive terms. Approaching search engine optimisation this way around is more productive and efficient than applying keywords to pages after the site's been built. When creating your keyword strategy, tools like SE Ranking, SEMRush or Moz can help immensely, showing you where you rank currently for specific search terms as well as how much search volume they have and how competitive they are. A good keyword strategy blends these three metrics to produce a shortlist of keywords for which ranking well is both highly desirable and achievable. Using the tools mentioned above, or another of your choosing, identify which keywords your site ranks well for currently, and decide which of these are actually attractive from a visitor quality and volume perspective. Alongside these, research new keywords (using educated guessing, buyer persona research or online suggestion tools to generate new ones) to add to your strategy. Once complete, your keyword strategy becomes a master document which informs the rest of your effective website build. The role of the sitemap in effective website design is to show which pages will be built and where they will live within the site. Your sitemap should embody the findings of the research you've done thus far, containing pages that align with your keyword strategy and your buyer's decision process. Every sitemap will be different but, in most cases, less is more. Buyers simply don’t come to your site to spend lots of time reading about every nuance of what you do, so cut down the number of pages wherever possible. Focus on providing content for each stage of the buying journey. For a professional services business, for example, key pages for the buyer journey might be homepage, services, case studies and a consultation offer. For a SaaS business they might be homepage, features, pricing and a demo or trial offer. LucidChart is a great tool for producing and updating sitemaps - its slick flowcharting functionality makes it a breeze to create your sitemap, which can then be shared in a variety of formats, commented on and kept up-to-date with changes. The impact of the main navigation on a website visitor's experience is often overlooked. The standard approach used to be to have a main navigation that included every category and every page of content so that the visitor could find exactly what they are looking for. This led to navigation menus with many options and huge dropdowns or 'mega menus'. All of which are bad for website effectiveness. Visitors are time-poor. You've only got seconds to engage them in the first place. If they click on a nav item and a huge dropdown appears with dozens of options, they are probably going to leave. It's your job, not theirs, to know what content they are looking for and to present them with the minimum number of options. "Simplicity is king! An overly-complex site navigation will leave your visitors confused like a tourist in a city without a map." Understanding the desired customer journey through your site, and presenting only these options, prevents your visitors from becoming weary looking for the right content. It demonstrates that you know your buyer and are confident in what you offer. Drop downs are not a complete no-no, as long as they are simple, but there are other ways to get people to travel the pages of your site, most notably, carefully placed calls to action. Where companies have adopted the pared back main navigation approach, there is a growing trend to use the footer to hold more granular navigation links. This makes good sense as it's at the end of page, not the start, where visitors should be looking for the next page to visit. So, when planning your navigation, include only the essential pages which support the buying process and leave everything else for the footer. Sitemaps are often mistaken for navigation plans, but they should differ, sometimes significantly. To tackle this, design your site's navigation separately and intentionally - although it can be useful if it lives on the same document as your sitemap to resolve any confusion before implementation. 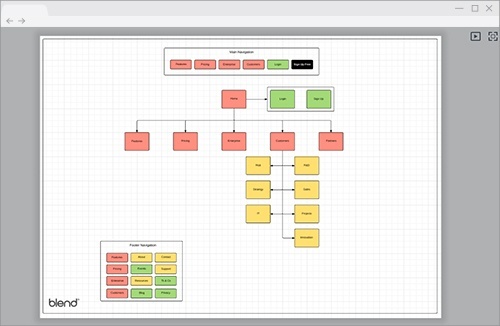 For this reason we use LucidChart again for navigation design. The same goes for any footer navigation links. 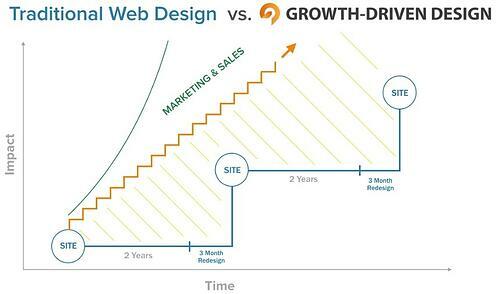 We're big supporters of the Growth Driven Design (GDD) approach to website design and development pioneered by Luke Summerfield at HubSpot. GDD is essentially an agile approach to building your website whereby, instead of planning out every step of the project in a long, waterfall-style, plan, you work in short sprints delivering prioritised chunks of the website over time. There is little point spending months and months creating every single page of your website before launching it. This is the way people have been doing it for years and it does nothing to maximise the effectiveness of your website. If you design and build everything before you launch, you ensure that cost and time are maximised before any return on investment is seen. You also launch with no feedback as to whether your design works or not, and you run the risk that your market, buyers, product or strategy has changed by the time your 'new' website is ready to go live. It's far better to build and launch the 'minimum viable product' as quickly as possible and then add to and improve this continuously. This way, you get the 20% of pages that do 80% of the work live quickly and can use the insights they generate to inform each subsequent update. The first step in agile website development is prioritising pages and features. A simple way to do this is to colour code your sitemap to indicate which pages are required before anything goes live and which can come one or two phases behind. After your first batch of pages is launched, you can plan the next phase and be on the lookout for issues or opportunities presented by user behaviour on your site. Before you begin designing pages, you should fully wireframe and write the pages that make up the first phase of your agile website plan. Working with wireframes and real (though not necessarily final) copy will help you to plan the customer journey through each individual page and the site as a whole. Wireframes are cheaper and easier, than full designs, to iterate as copy or layout changes, helping you to create the most effective website possible without becoming stuck with a sub-optimal design. Wireframes can range from low to high definition, but it's usually wise to start with simple wireframes and only add more detail once you have some confidence in the content. Creating wireframes in Sketch, PhotoShop or Illustrator can save time in the design phase. If the person creating them isn't familiar with those applications, however, LucidChart is a great alternative. The homepage is a crucial element in effective website design and is likely to create the most debate during the design process. The first thing you have to get right on your homepage is the header section, as this is the only thing new visitors will read before deciding to stay or go. To ensure the right visitors decide to stay, you need to tell them exactly what you do and who you do it for – your value proposition. 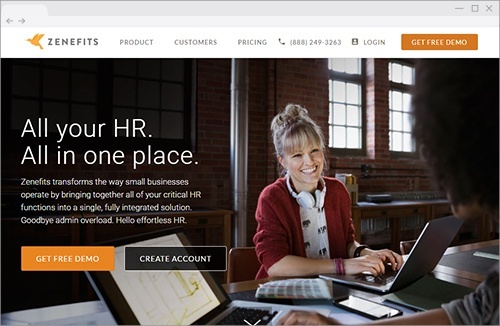 Businesses often forget about the first time visitor when designing their homepage headers and spectacularly fail to communicate their actual value proposition. It may be because it feels unimaginative to say 'We do X for Y', but nothing is more effective at getting you past the blink test. 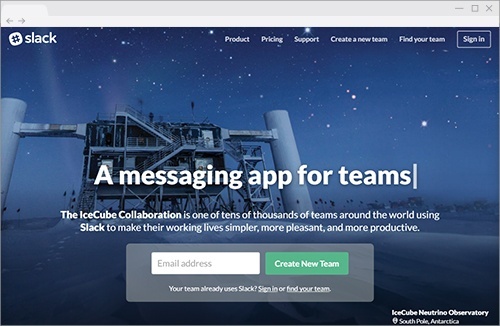 Homepage value propositions don't get much simpler, or better, than Slack's. The other thing that damages homepage effectiveness is sliders (aka carousels). It's been proven that sliders are bad for SEO and bad for user experience. Sliders are also lethal to positioning and communication of your value proposition. If you include a slider in your website design, you are forcing yourself to come up with multiple top-line messages. These manifest themselves as multiple H1 headings, diluting your SEO, and confuse visitors as to what you stand for, diluting your website's effectiveness. Users of sliders often put alternate versions of their supposed value proposition, company news or product launches in them, none of which tackle the real objective of getting a first time visitor to say 'Hey, I'm in the right place', and, guess what, those things are what the other pages of the site are for anyway. So, do yourself a big favour - ditch the slider, and come up with a truthful, concise and compelling value proposition to take top spot on your homepage. For your website to be effective, it must convert anonymous visitors into leads, opportunities or customers. Most current websites are designed with one contact page. In our experience, these are practically toxic to prospects. Maybe it's the open ended-ness of it – 'contact me' is very vague – or maybe clicking to another page is a bridge too far. I don’t know what it is, but I've never seen a contact page that generated leads well. The solution to this is to provide multiple conversion points throughout the site. Each conversion point must be specific about what the buyer will get in return – 'request pricing', 'book a demo', 'try it free' are all better than 'contact me'. Conversion points should be placed thoughtfully where you think they are most likely to been seen by buyers at the right stage of the buying process. A conversion point can be a call to action leading to a landing page or a form right on the page in question. Regarding contact forms: If a visitor has a general question, why not make it easy for them to ask it wherever they are on your site? We've seen contact forms in the footer perform far better than dedicated contact pages. Search engine optimisation is a huge topic, far too big cover in detail here. But here are some of the golden rules to follow when you are doing the on-page SEO on your site. First off, don't forget to refer constantly to your keyword strategy. To stray from it now, even slightly, will lay waste to a lot of your effort to make your website an effective one. Next, think of your website as a pyramid. At the top, the peak, is your homepage. You want this to rank for your most attractive, and probably most competitive, target keywords. The layers beneath represent the layers of content in your website. In SEO terms, the role of each page is to help the pages above it rank for their target keyword. At the bottom is of the pyramid, hopefully, is your blog, where you have a high volume of pages on a wide range of topics, all internally linked to help site pages rank for their target terms. Sites don’t rank: pages rank. If you want to rank for a keyword, you’ll need to determine which page is going to be the page ranking for that keyword. Don't build another brochure site. Don’t spend six months and tens of thousands of pounds before launching something. Don't forget the buyer. Follow these guidelines, and your new website will have all the crucial elements to deliver the leads you need to grow your business.